Jane Fonda isn't shy about saying she has had a little "work" done on her eyes, mouth and jawline. 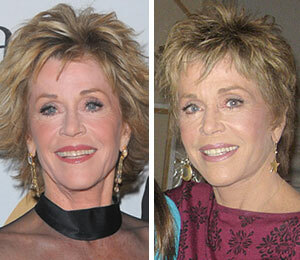 Fonda is pictured in January on the left and in February on the right. See photos of fabulous stars over 40! "[Producer] Bob Evans complimented me on my new, short haircut and I said, 'Thanks. I just had some "work" done on my chin and neck and had the bags taken away from under my eyes so I decided it would be good to get a new hair cut so people will think it's my new hair.' He thought that was so funny he actually toasted me for doing what he said he'd never heard anyone do before: admit they'd had work done. I was planning on blogging about it anyway so who cares?" "I was in front of the camera all day yesterday and was photographed at Eve Ensler's luncheon 9 days after the procedure so, obviously, it went well. I swore in 2000 I'd never have anything done again but this year I got tired of not looking like how I feel and I wanted a more refined chin line like I used to have so I changed my mind. I'm still a little swollen but not much and what pleases me is that I won't looked pulled or weird...or tired all the time. And my crows feet are still alive and well.. I wish I'd been brave enough to not do anything but, instead, I chose to be a somewhat more glamorous grandma."